he name of Jessie L. Weston is familiar to scholars of European literature on account of her studies of medieval literature in relation to Celtic and Germanic mythology, and in particular for her books and articles about the Grail legend. In Legends of the Wagner Drama Weston discussed the relation between various Wagner dramas and those medieval poems and sagas on which, in her view, Wagner had based his dramas. In her treatment of Parsifal, extracts from which follow below, Weston compares and contrasts the action of Wagner's drama with the poem Parzival of the German poet-knight Wolfram von Eschenbach and with the earlier Perceval or Li Conte del Graal of the French poet Chrêtien de Troyes, together with other, lesser poems of the same period. Weston is perceptive in identifying the elements of these sources that were adopted and adapted by Wagner. She also indicates where Wagner has deviated from the story as told by Wolfram for purposes of his own that Weston does not attempt to explain. Weston's interpretation of Parsifal has been (and continues to be) highly influential for the understanding of Wagner's last drama throughout the English speaking world. Quotations from Wolfram's poem were taken from Miss Weston's own English translation. Right: The Grail Castle in the midst of a forest. Cover of King Ludwig's Diary. he keynote of the drama is struck in the peace of the opening scene; the repose of the Grail watchers, the solemn call to prayer from the castle, and the rising sun flashing the lake mists in the background. Wagner has followed his source [i.e. Wolfram] in placing the mysterious castle in the midst of a forest, and representing its discovery as a task in which both human skill and energy are unavailing. Both in the poem and in the drama the guidance must come from above; and the fact that Wagner apparently considers the guiding power to be the Grail itself, while Wolfram believes the guidance to come directly and immediately from God, is apparently due to the more definitely Christian character ascribed to the Grail by the dramatist. he name of the castle, Monsalvat, is of course derived from the Monsalväsch of the Parzival (a name peculiar to the legend), where the derivation appears to be 'Mont Sauvage', from the wild and lonely character of the surrounding district, a feature emphasized in the poem; but some scholars would explain the terms rather as signifying Mount of Healing (or Salvation), a rendering to which Wagner, from the form given to the name, seems to incline. to its locality Wolfram is by no means explicit: he certainly never says it is in Northern Spain, where Wagner places it; according to his statements it was within thirty-six hours' ride from Nantes. 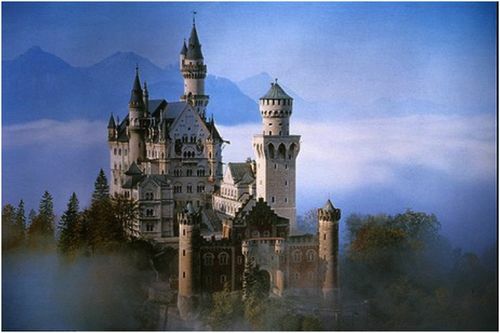 Writers later than Wolfram, however, do locate the Grail Castle in Spain, and the idea seems to have originated with the writer of Der jünger Titurel, a poem which deals very fully with the Grail and its guardians, and, long attributed to Wolfram, is now known to be the work of a certain Albert von Scharffenburg, a very inferior poet. This location of the Grail Castle in Spain is of course favoured by those scholars who regard the Grail myth as of Oriental origin, and the Spanish Moors the medium of communication to Europe; but as a matter of fact there is practically no evidence to connect the Grail with Spain, saving the statement, which Wolfram refers, and probably correctly, to his French source, that the legend of the Grail was originally found in an Arabic manuscript at Toledo. The truth of this statement may be gauged by the fact that the same manuscript is stated to have contained the story of Parzival, the Aryan-Celtic origin of which is beyond doubt. It is much more in accordance with the general indications of the legend to believe that the poets imagined the castle to be situated in the northwest of France. ut in the process of development which the legend has undergone, the nature of the castle to which the hero pays at first an abortive, and afterwards a successful, visit has passed through various transformations. 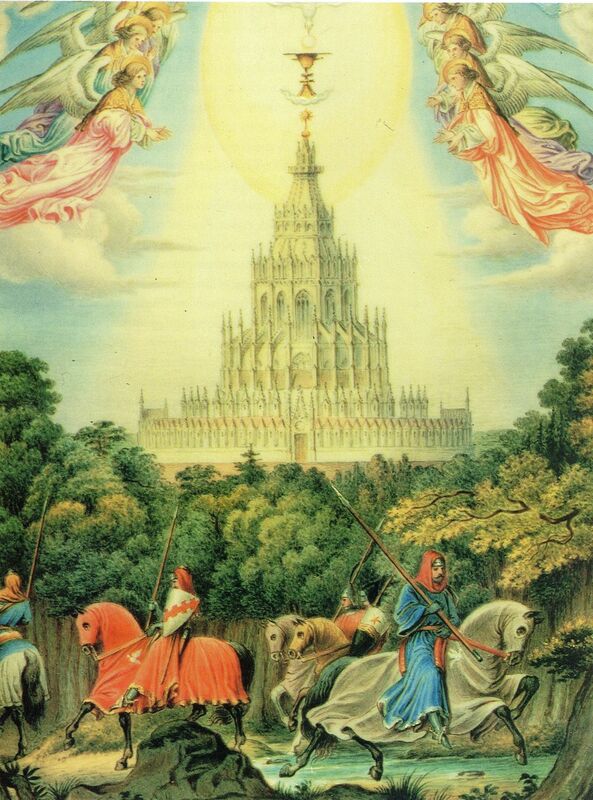 At first it probably symbolised the abode of the departed, and was as such identical with the castle of Brynhild which figures in the Thidreksaga [the saga of Dietrich von Bern] and the Nibelungenlied; and the hero's task was to break the spell of death or slumber binding the inhabitants. In the performance of this task certain talismans not infrequently played an important part; gradually these talismans became Christianised; and now in the Grail legends we have two castles -- one, that of the Grail, the other, retaining its pre-Christian character, being known by varying names, the Castle of Maidens, the Château Merveil, or as here, Klingsor's Castle. Such a bespelled castle is undoubtedly an original and essential feature of the Perceval story. he Parzival gives no account of the building of Monsalväsch, such as Wagner puts into the mouth of Gurnemanz, but simply speaks of Titurel as being first king and ruler of the Grail and its knights; but elsewhere Wolfram is more explicit. Among the works which the poet-knight has left are poems, or songs, dealing with the loves of Sigune and Schionatulander, four in all, but critics are doubtful whether more than the first two can be rightly ascribed to Wolfram. In the first of these poems, which are classed together under the name of Titurel, we find the old king, oppressed with the infirmities of age, resigning his kingdom to his son Frimutel, and telling him that he received the Grail from the hands of angels, that he was the first mortal to whose charge it was committed, and that the rules for the order of Grail knights were found on the mystic stone. There is no mention of the Spear here, nor of the building of Monsalväsch, the reason probably being that both castle and weapon were older than the Grail myth, and the writer accepted them as he found them. t is doubtful whether the Titurel preceded or followed the Parzival; probably the latter, and Wolfram's intention was to fill up lacunae in the history of Sigune, who plays an important part in the Parzival. Its statements agree with those of the more important work, and a common source is evidently at the root of both. The old knight Gurnemanz, who is so prominent in the drama, is also a characteristic figure in the original Perceval legend, where his office is to instruct the hero in knightly customs and bearing -- instruction of which he has much need. The Welsh (Peredur) version represents this character as identical with the Fisher-King, and as uncle to the hero; but he is, as a rule, distinct from both, and the relationship of uncle rather pertains to the Hermit, also an essential character of the legend, whose office it is to direct the hero's spiritual development, whereas the old knight's teaching is directed rather to his outward bearing (combined in the case of Gurnemanz of Graharz with a good deal of ethical teaching). n Chrêtien's poem the name of the knight is Gonemans de Gelbort; Gerbert, one of Chrêtien's continuators, calls him Gornumant, of which form Gurnemanz is obviously the German rendering. It will be seen that in the drama Wagner has united the characters of these two instructors in the person of his rather didactic old knight: the Gurnemanz of the First Act answering to Gurnemanz of Graharz, who appears in the Third Book of the poem and not again, though he is frequently alluded to as a model of knightly wisdom, skill and courtesy; the Gurnemanz of the Third Act answering to the Hermit Trevrezent, who in the Ninth Book of the poem unfolds to Parzival the mystery of the Grail, and restores him to faith in God. 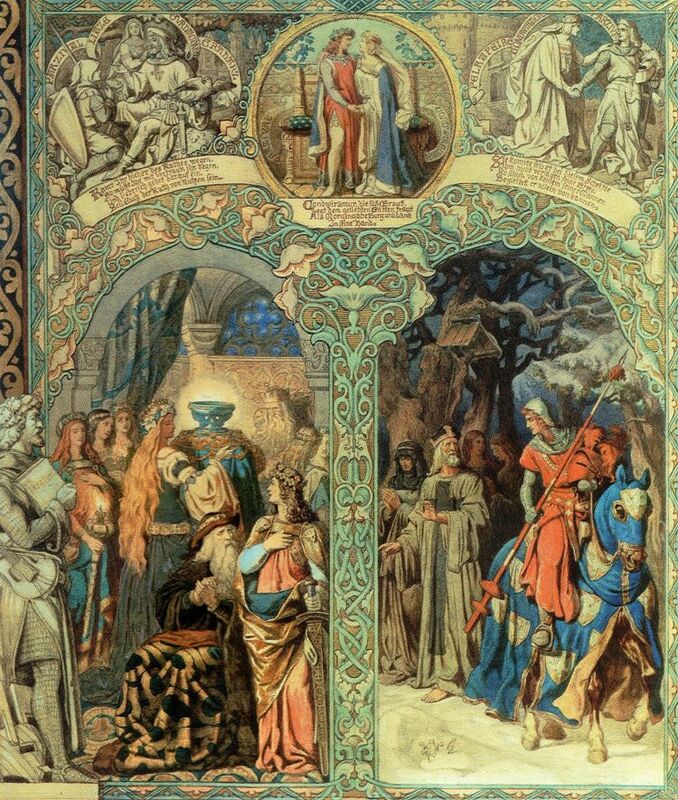 Above: Scenes from Wolfram's Parzival in a watercolour by Eduard Ille, 1869.
he Fisher-King, the wounded lord of the Grail, appears in every version of the Grail myth; in the English Sir Percyvelle, in which the Grail does not appear, alone is he missing. Belonging to that part of the Perceval legend which has been most strongly and directly affected by the development of the Grail myth, the character of the wounded king has now become so closely associated with the Christian talisman, that even when the earlier form of the legend has become obscured, and Perceval himself has ceased to be par excellence the hero of the quest, the wounded king, the Rich Fisher (varying names for the same character), still retains his connection with the object of that quest. a rule the king is represented [in the romances] as an old man; that Anfortas, in the Parzival, appears in the prime of life and manly beauty is due to the youth-bestowing properties of the Grail; Trevrezent, the Hermit, who is spoken of throughout as an aged man, is Anfortas' younger brother. 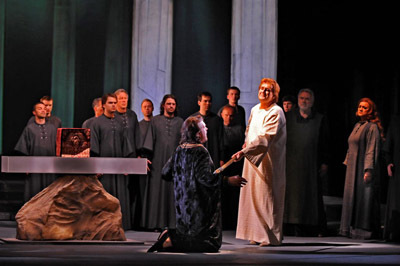 In his representation of the Grail king, Wagner has, on the whole, followed the indications of his source; one generation has been dropped out, and Amfortas appears as Titurel's son, and not his grandson, thus heightening the tragic effect of the king's refusal to unveil the Grail; and the relationship between himself and Parsifal no longer exists. The distinctive feature of Wolfram's version, and that which has given Wagner the hint for the colouring 'motif' of his drama, lies in the fact that he represents Anfortas as wounded in punishment for an unlawful love; in other versions the king is wounded in battle, or accidentally, by handling a mysterious sword destined for the use of another. This change, thoroughly in harmony with the high spiritual and ethical treatment which raises Wolfram's version of the legend so immeasurably above those of the French poets, has been utilised by Wagner to the great benefit of the character of Amfortas, which in the drama possesses a significance altogether lacking in the legend. hy Wagner changed the name of the king from Anfortas to Amfortas does not appear: the original form is supposed to have been derived from the French Enfertez = the sick man, with Provençal ending -as; names derived from Provençal French being a marked feature in Wolfram's poem. e not infrequently meet with the statement, in print, that it was Chrêtien de Troyes who first identified the Spear with the Spear of Longinus, and the Grail with the vessel of the Last Supper; but both these statements are incorrect. True, the Spear is so spoken of in the introduction to Chrêtien's poem, and Spear and Grail are alike Christian symbols in the minds of Chrêtien's continuators; but the introduction is no less the work of a hand other than Chrêtien's, than is the continuation (or, to be more correct, continuations), and he himself gives no account of the origin of either. he fact seems to be that the Spear was, as Wolfram represents, the weapon with which the king was wounded; and although Wagner has radically changed the character of the weapon, yet in representing the Spear, rather than the Grail, as the object of the hero's quest, and the animating motive the desire of healing the maimed king, he is probably reproducing with fidelity original features of the story. No one can quarrel with Wagner for having represented both Spear and Grail under the more fully developed Christian character in which they are most familiar to us; the fact that he has done so bears out the contention advanced above, that in the Parsifal Wagner has been singularly happy in emphasizing the spiritual significance of the legend without detriment to its original form. and bowed him beside her knee. scarce wist he what made him sad! 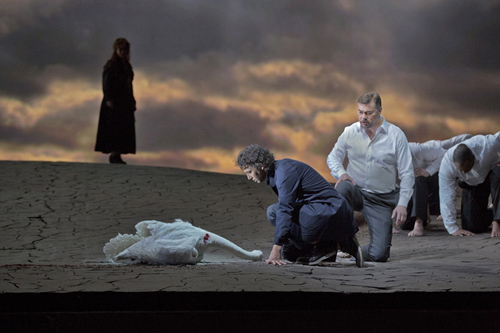 Above: Kaufmann and Pape with the Swan. NY Met 2013.
to the sun's hate hast thou been born! now hast thou this fair chance lost! Left: The Grail Temple, Bayreuth 1882. 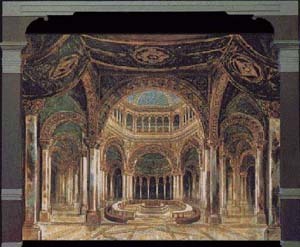 After the design by Paul von Joukowsky. ©Cologne Theatre Museum. - words in which we find the source of Gurnemanz's taunt, cast by Wagner in a more homely and proverbial form. The whole incident has an unmistakable 'folk-lore' flavour about it, though perhaps it is more common [in folk-tales] to find that not the folk alone, but castle or palace itself, has vanished, and the hero awakes to find himself lying on bare ground.